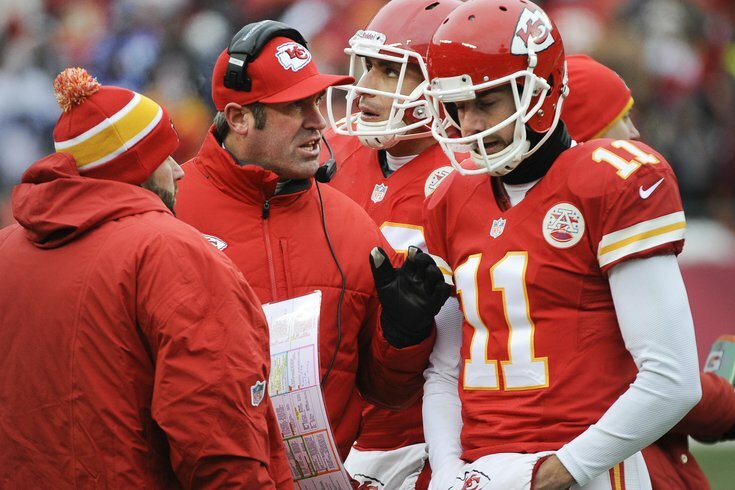 Kansas City Chiefs offensive coordinator Doug Pederson talks to QB Alex Smith. Now that we know Doug Pederson will be the next head coach of the Philadelphia Eagles, it's time to do what we do best: react. The hiring can't become official until the Kansas City Chiefs are eliminated from the playoffs -- they play the Patriots on Saturday -- but Les Bowen of The Daily News first reported on Thursday that the former Eagles quarterback and assistant coach will succeed Chip Kelly as head coach. Pederson, who has been the offensive coordinator in Kansas City since Andy Reid was hired there prior to the 2013 season, didn't interview with any other teams. But considering how familiar owner Jeffrey Lurie, president Don Smolenski, and Howie Roseman are with Pederson, but the guys he studied under -- like Reid -- those tasked with picking the team's next leader may have felt they knew something others did not. Just don't tell the fans that. I have no take. I wish it was someone more exciting but it is what it is. Hope it works. Whatever who cares let's drink. Isn’t this basically the Eagles admitting firing Andy was the wrong choice? What if I told you that Doug Pederson would be the head coach for 9 games before Donovan McNabb took over? You down with that? It’s about time for the Eagles to consider firing Doug Pederson. He hasn’t even won a playoff game since taking over. Happy for Doug! He is a very good guy! Doug Pederson will sap Philadelphia of its collective will to live. I’ll say this, if there’s one town who loves their mediocre white backup quarterbacks, it’s Philadelphia. Hoping Kansas City makes it to the Super Bowl so we draw this out as loooooong as possible because we deserve pain.